Drinks and desserts make creative companions, indeed, bringing out the best in sweets like this mini red velvet cake bite with cream cheese frosting. 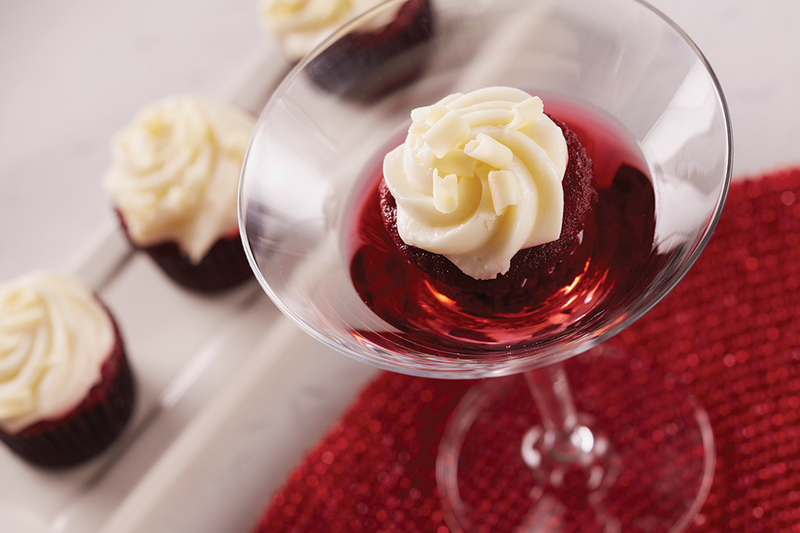 Drinks and desserts make creative companions, indeed, bringing out the best in sweets like this mini red velvet cake bite with cream cheese frosting. photo courtesy of the cheesecake factory bakery. The economic downturn of the past five years has squeezed restaurants’ bottom lines. But no category has suffered more than desserts—the indulgent finale to a great meal out. To lure diners into staying put, operators have had to dream up creative ways to trigger dessert purchases. Fine-dining full-service restaurants, where price isn’t usually a consideration, have long paired after-dinner wines and cordials with desserts. But a new and increasingly mainstream approach serves classic and imaginative sweets in fresh, modern ways. Now, artisan beer is stepping up to the dessert plate. Dessert “flights” offer tastings of one or more treats to satisfy diners’ impulse to share. And successful pastry chefs are working hard to convey why their dessert course is one not to miss. Diners are more likely to order a great-tasting dessert that offers indulgence presented in a newly inviting way. Pairing sweets with drinks is a practice that’s ages old. It works for good reason. Rick’s Dessert Diner, a retro-inspired dessert hotspot in Sacramento, will soon add wines to its menu of gorgeous cakes and pastries. Rick’s benefits from the trend toward all-day desserts: Sweets are moving from the confines of after-dinner treats and into the category of anytime snacks. By offering dessert-and-wine pairings, the restaurant expands its horizons—and its check averages. Other operators, such as The Wine Cellar & Bistro in Columbia, Mo., are using dessert as a way to highlight a commitment to local spirits and wines. Its Locavore Cheesecake is a peanut butter-goat cheese cheesecake with a pecan crust, topped with goat milk caramel and chocolate buttercrunch. Sommelier Sarah Cyr pairs it with 1855, a small-batch sherry from Adam Puchta Winery in Hermann, Mo. Tradition once mandated that the beverages in a multi-course meal grow increasingly intense as the meal marches on. Some fear the dessert beverage will taste weak, compared with those that came before. But successfully pairing a dessert with a glass of wine, cordial or another beverage should bring out the flavor in both. Growing popularity in artisan beer is one trend operators are using to capture the attention of diners who may not be drawn to dessert. Beer is appealing for two reasons: It attracts men, and it’s relatively inexpensive to pour. Pairing beer with desserts freshens up the presentation of each. Barley wine, imperial stout and double IPAs often end meals, but they’re best paired with the richest, fattiest desserts on your menu. Imperial stout was practically made to enjoy with flourless chocolate cake. Belgian, German and some English ales, as well as sweet fruit-forward beers, pair well with fruity desserts. Jimmy MacMillan, executive pastry chef of Cathedral Hall in Chicago, says he knows how hard-hit restaurants have felt in recent years. That has been especially true for more adventurous culinary experiences, which diners might not consider worth the extra expense during lean times. A growing number of diners with special dietary needs also get to indulge in a gluten-free and vegan dessert composed of Asian pears, huckleberries (sun-dried and rehydrated with hibiscus flowers), cucumber sorbet and an assemblage of hazelnut cookies. These layered desserts offer great value—and they look spectacular. That’s why he sends complimentary desserts into the dining room anytime it’s more than half full during the first 30 minutes of service. Dessert sales always spike.